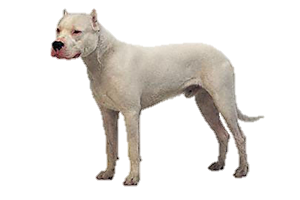 The Argentine Dogo is a large scenthound that was bred specifically to hunt big game such as wild boar, puma and jaguar. Their job is to track the prey in silence, attack and corner it, and then hold the quarry at bay until the hunter could arrive and make the kill. Their secondary roles, particularly in their homeland, include property guarding, search and rescue, police work, and therapy dog. The creation of the Argentine Dogo was begun by two brothers in Argentina, Antonio and Augustin Norez Martinez in 1925. At the time they were only 18 and 17 of age, but the task would take a lifetime. They began with 10 Cordoba Fighting Dogs, which are now extinct. The Cordoba was known around Argentina as a fearsome fighter and supreme boar hunter, but their aggression made them unpredictable around humans and impossible to use in a pack. Their breeding program consisted of the addition of at least nine other breeds, the Pointer, Boxer, Great Dane, Bull Terrier, Bulldog, Irish Wolfhound, Great Pyrenees, Spanish Mastiff and Dogue de Bordeaux. For over 20 years the brothers perfected their dogs and released their first standard in 1947. Unfortunately, Antonio died during a boar hunt nine years later, but Augustin continued to promote the breed and after becoming an Argentine ambassador found it easier to introduce them around the world. Today they remain somewhat rare and are even banned in some countries as a “dangerous breed”, but maintain a strong following.